Every wizard, sorcerer and bard knows deep within that his abilities are a pale imitation of the true power that dragons embody, and every new avenue of research is an attempt to find the original path of magic. Dragons continue to practice their arts looking at the mortals trying to reach beyond their own limits with amusement, worry or admiration. Some of these magnificent beasts even teach their craft to those whom they deem worthy but they must do so with care, lest the weight of the lesson break their mortal pupil's minds. Dragon magic, or dracomancy, groups the disciplines that arcane spellcasters have discerned from their study of dragons. From wresting the hidden meanings behind the Draconic language to tapping into the residual magic in dragon's bodies, they search for the key to the dragons' might. There is still no mortal spellcaster who can claim to have mastered all, and thus achieved the pinnacle of dracomancy: to wield magic as a dragon. * Dragon Magic - An Overview: A summary of the powers and linguistic magic inherent in dragons. * Draconic - Language of Magic: An indepth study of the power of Draconic language. * Dragoncraft - Magical Resonance: Dragons are magical creatures, and their very bodies can be imbued with their powers, even after their deaths. * Ascendancy - Primordial Blood: Awakening the power of a draconic heritage in your ancestry. * Dragon Mastery> Presenting the dragon master prestige class. 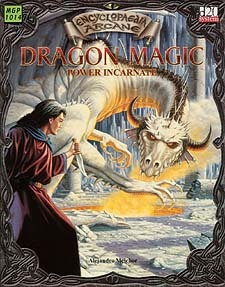 * Dragon Magic Feats: A slew of feats focused at awakening or controlling dragon magic.